Eating Insects. No, Really. Introducing Chapul. Chances are you’ve already heard of our newest Whole30® Approved partner, Chapul. Their edible insect bars (really!) have been all over the popular national news outlets lately (big time sites like HuffPost, Slate, and CNN)–but there’s more to this company than the shock-factor of eating bugs. 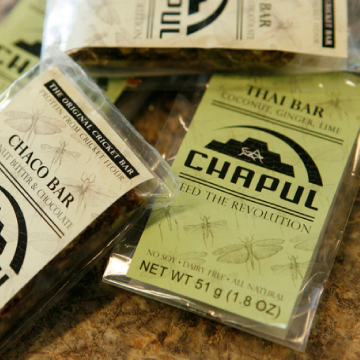 Founded by Salt Lake City local Patrick Crowley, Chapul has its roots in water conservation, and was inspired by Dr. Marcel Dicke’s TED talk on entomophagy. 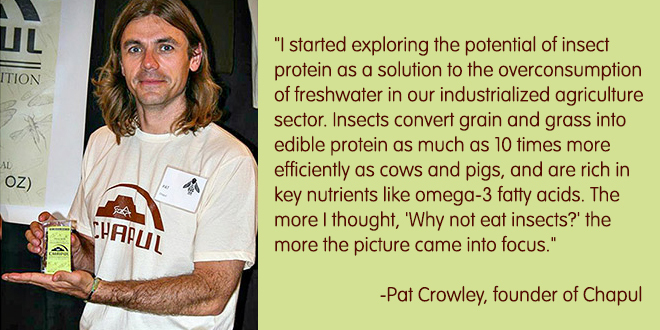 After hearing Dr. Marcel, Pat began to look deeper into the idea of insects as a more sustainable source of protein for humans. We love the name of your company. What does it mean? Chapul is a Nahautl (Aztec) word that means “cricket” or “grasshopper.” The Aztecs were avid insect eaters, making large treks to collect them en masse. They would sun-dry them, mill them into a flour, then bake a protein-dense bread out of them. This practice, in part inspired our project. Why crickets? Why not caterpillars or potato bugs? Crickets are high in protein, iron, and calcium, and are some of the most commonly eaten insects in the world. That having been said, there’s nothing to say we won’t incorporate other insects into food products in the future. Crickets are fairly easy to raise from an agricultural standpoint as well. They have a relatively short life cycle, and can be raised with very little land resources. There is currently lot of great work being done to develop the technology to raise them within an urban environment. From an environmental standpoint, crickets convert 10 lbs of feed into about 8lbs of biomass. Compare that to only 5lbs of chicken, 3 lbs of pork, and a mere 1lb of cow from the same amount of feed, as well as emitting far fewer greenhouse gasses than traditional livestock. All that being said, we intend to incorporate other insects into our products as consumer interest in alternative protein sources increases. Getting folks interested in eating insects can be tricky. Why is your product perfect for our community? Insects were a regular part of the traditional human’s diet, so our intestinal tract has evolved to digest insect proteins. Here in Utah, there is evidence of pre-historic cultures receiving such a high return on protein collected from gathering grasshoppers, that they gave up hunting mammals altogether. Incorporating the insects in powder form relieves most of the cultural fears of trying a new ingredient, while still delivering all of the health benefits. Also, we know that many of those in the Paleo community have already embraced the consumption of foods that are not common in our current food culture. Your readers are some of the more likely people to quickly see the many benefits of our bars. We’re very conscientious about the quality of our protein sources. What are crickets’ nutirtional stats? The quality of cricket flour is exceptionally high. The flour itself ranges from 55-65% protein, contains no sugars, and is complete with all of the essential amino acids, as well as many micronutrients. So are your crickets free-range and grass-fed? Do they frolic among the daisies in the sunshine? We ensure the crickets are fed a high quality, non-GMO diet. We have experimented with traditional livestock feeds, as well as agricultural by-products–parts of crops that are inedible to humans, like broccoli stalks. As for daisies and sunshine, crickets aren’t the biggest fans of sunshine, actually. They prefer dark, high density populations, which makes them fairly easy to farm. However, the high reproductive rates are pretty solid evidence that there is a lot of frolicking going on. We hear you’re gearing up to sell cricket flour. What’s the scoop? Since we’re pioneering a new industry, we’re trying to develop a more efficient and cost-effective way to get cricket flour available on a retail level. However, we are beginning to distribute it in limited quantities to select people and organizations… for example, the good people at Whole9. The quality of cricket flour is exceptionally high. The flour itself ranges from 55-65% protein, contains no sugars, and is complete with all of the essential amino acids, as well as high in calcium and iron. In a 35g serving of our Chapul Cricket Flour, there are 140 calories, 21g of protein, 1.5g fat, and 11g carbohydrates. Think you’ve got what it takes to capture the taste buds of health-conscious men and women across this nation? Submit your flavor idea in comments below*, and if you have a Facebook account, please “like” Chapul. *Submissions must go through the website comments, and not via Facebook, please. Cardamom raspberry cricket. Just like a warm, homemade pie, but with added benefits and non of the gluten. Oh, and cinnamon-date. I love the warmth of cinnamon and the sweet from dates in combination. the Bali Hai bar – tropical fruits and coconut (pineapple or mango or papaya – whatever is easiest to produce). cocoa cricket crunch – I like alliteration. but honestly cocoa and macadamia nut (or hazelnut…nom nom) is the quickest way to get me to eat anything. the other way is garlic and butter (the only way I would eat snails) or bacon (the only way I would eat oysters, blech). Seriously – mollusks are okay to eat but not insects? I know replicating treats isn’t the whole30 way, but I think the larabar method is the best way to get crickets to the masses. Cocoa and chipotle pepper maybe…. y’know for the guys who are more beef jerky fans…. Banana, date, walnut “bread” or “Cinnamon roll” or “Coconut Macadamia”. I’d love to eat any of those! Apple Cinnamon – with some cold pressed dates and some cashews to fill it out. I see it being cold pressed dates and apples, with cashews, Chapul and Cinnamon. Thai Curry – a coconut based green or red curry flavoured bar. I guess it depends on the texture of this product…. Sweet Potato/Coconut/Smoked Paprika that would be amazing!!! Cranberry and Coconut. That’s a favourite too. I say keep it simple and go with an unsweetened cocoa and coconut for a smooth chocolatey flavor or vanilla bean. I like the idea of cinnamon apple as well. I would definitely get down with these bars! Sweet potato cinnamon would be fantastic. Well, what’s the flavor of the cricket flour itself? Are the crickets roasted before drying/powdering? Dark chocolate, coconut and almond bar. Something that would rival a Mounds/Almond Joy combination. One would never be tempted to eat candy again if you made a healthy alternative. I suggest a clean and fresh flavor of lemon and basil with possibly a hint of vanilla. So my recipe suggestion would be a lemon, basil Chapul bar! Cacao, cherry, coconut chunk. Bittersweet, but with nutritious fat and protein. I would use cacao powder, cricket flour mixed with small chunks of dark cherries and unsweetened coconut flakes. I would suggest a savory flavor – “Garam Masala” – basically a powdered mix of cumin, coriander, cloves, black pepper and a little bit of cinnamon and nutmeg. The Turk bar – fig and hazelnut…cocoa is optional. Dark chocolate raspberry, no question. I’d totally eat these for sure. The Hopper… beer flavoured bar with hops :) eh? eh? maybe? I would dig a matcha green tea flavor. Especially paired with berries (strawberries or cranberries) or citrus (tangerine or orange). Cinnamon + Dates + Pecans + Cocoa = Yum!! I vote for cocoa cayenne. This is really exciting to me. I would have absolutely no problems eating insects in a bar, I’ve done it many times and find them delicious! I would do coconut and cranberry or carrot blueberry! I think a chipotle cherry cocoa bar would be great. Or a dessert flavor like apple pie or pumpkin pie. Coconut curry! Meaning Indian-style curry. Yum!! One more comment – any chance this can be a high protein, lower carb bar? Your bars sound great, but they are awfully carb heavy, without a large amount of protein. Would love a higher dose of cricket! “The Americas Bar” — Whole30 Approved! I was thinking the same as Rebecca Godfrey, dark chocolate, coconut and almond bar. That sounds delicious! I also would love something with lemon and nuts or sweet potato and cinnamon. Please do savory flavors. Eating something that’s supposed to taste like dessert makes me want real dessert and that makes me sad. I’d rather be happy, which is why I’m doing the whole 30 in the first place! any information on how cricket flour is prepared? 1. Sunset Bar- passionfruit, macadamia, coconut (inspired by the Hawaiian dessert Lilikoi Bars) Could also sub the passionfruit for a pineapple and lime combination. 3. Nutty Chai – Hazelnuts, dates, cardamom, cinnamon, clove, fennel, peppercorn, star anise, and possibly chia seed. All of these ideas sound awesome! 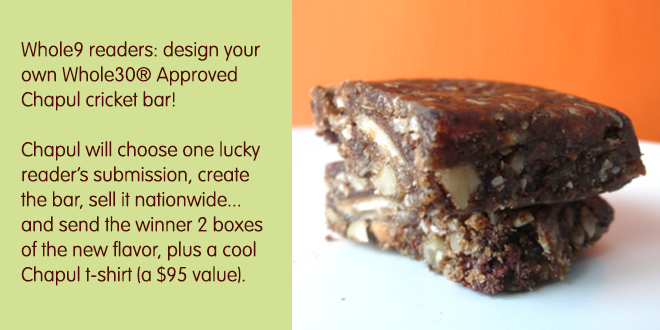 I first saw this idea for cricket flour bars on kickstarter and thought it was brilliant. A paleo bar is darn near impossible to find. I really like the idea of a coconut, lime, macadamia, (pineapple?) bar with just a hint of cilantro to really make it sing. Maybe a salted caramel flavor with a bit of mocha flavor? Whatever flavor is chosen, count me in! I’d love any flavor (especially coconut, mocha, or coco flavors) with a low-sugar content, but I’d like to request a nut-free bar. I have nut allergies. Though I’d love to enjoy this exciting source of protein, I can’t do that if this product contains any tree nuts or legumes. kale, coconut + spicy North African awesomeness. If you pick this one, really Mel should count as the winner. But I would eat some, so I would win, too. Cinnamon cardamom would be amazing. So excited to hear about this new protein source, whole30 approved! And I cannot wait to try the cricket flour. A sweet and spicy flavor. Not entirely sure how you’d make some of these W30 compliant, but they all sound fantastic. My mouth is watering. This comment thing is confusing! Here’s my (facebook) post from the first day- I think this would be awesome with cinnamon, pecan/almond pieces and shredded coconut. A pinch of cardamom and/or nutmeg would round out the flavors and you could even turn it into a carrot cake bar by adding some shredded carrot. how about macadamia nut or pistachio or walnut? or mixed nuts? A “crickle” or a “turket” bar. That would be a bar with pecans, some sort of coconut milk/cream/butter caramel, and dark chocolate with ground crickets somewhere…like a “turtle” candy. I’d try that! Red velvet, like with real beets. Or beet cinnamon. Or beet orange. Tarragon, dark chocolate, cocoa nib, walnut, and dried apricot. Dried blueberry, toasted walnut, coconut. Or something with seaweed, like a fish jerky sushi roll type thing. Sweet potato, pepper, pork jerky (is that possible? ), onion, garlic, bay, tomato. If you dry all those things out, it might be possible. Strawberry balsamic (+brownie?). Rosemary apple chestnut. Kabocha squash mushroom kale coconut (no idea how that would work). Lavender and something, maybe almond? pear? blueberry? chicken jerky with herbes d’provence? lemon? cardamom? apricot? cashew? Olive pesto and sun-dried tomato, maybe with a dehydrated zucchini base? Taco? Tomato basil cashew? Caesar salad? Okay, I’m officially out of ideas. For now. carrot cake or zucchini bread. Here’s my take on it! Wings Over My Yammie – Sweet potato, cinnamon and coconut oil, maybe a lil vanilla to sweeten the deal. So which flavor won? It says winners would be chosen on 8/16. Our Chapul contest winner is… Erica! This contains agave syrup and peanuts. Why is this approved for Whole 30? Not saying it’s a bad product, but why this huge exception? Any pain is a sign: our body tries to tell us something. Rudy Silva has a degree in Physics and is a Natural Nutritionist. I found out about this protein bar off of Shark Tank and I wanted to try it! A good bar would be strawberry and blueberry Chapul bar or Apple Cinnamon chapul bar. I’d live to see something savory and crunchy. Garlic crackers? Would be awesome for guac and salsa! Lemon blueberry bundt pound cake was a favorite treat. If there was a way to incorporate the rich taste of butter or ghee with that fruit combo but not too sweet would be nice. Or something with lavender. Lavendar lemon with a dusting of ginger! That sounds lovely. Chocolate and curry with nutmeg. I am so excited to try these! This is not about a flavor but, perhaps, another applicatiom for your criicket flour. Could there be a place for it in gluten free baking? I have found the current options for gluten free flour to be rather low on the nutrition scale. I would love to see the above application seriously considered. With gluten sensitive numbers growing, I could see some serious money if your product could be used in the above manner. Think, bread, cakes, cookies etc. Some sort of savory curry! I hate only having “sweet” bars to choose from for snacks. Linda – Love that idea. I agree.. sometimes the sweet is just too much!